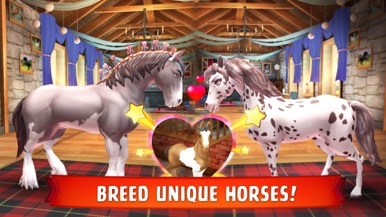 • In the name of love, the new exclusive horse "Amour" is coming to be your Valentine! And in the new Valentine event, you can earn love wings to help better enjoy your game. • Welcome the coming spring with the new common horse (the Sorraia) and the Spring Twins breeding event. • Find new tier 4 horses, Andalusian, Jutland, and Exclusive Knight. THE WORLD IS YOURS, MAKE IT THE PERFECT HORSE HAVEN! Create and manage a dream horse farm spanning multiple exotic sites all over the world. 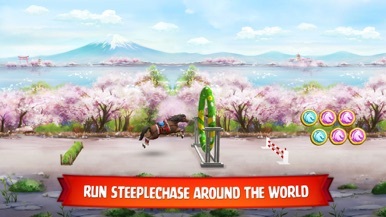 Raise the perfect horse companion and join together in fun steeplechase races and activities! 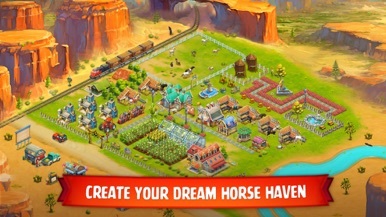 - CREATE YOUR DREAM HORSE HAVEN around the world: a majestic ranch in the USA, a charming stud farm in France, an enchanting valley in Germany, a picturesque rural town in England and a gorgeous Fantasy Island. 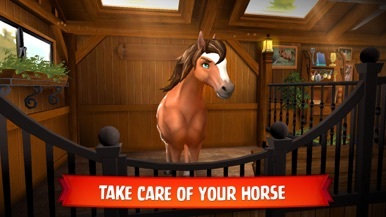 - RAISE THE BEST HORSES: pet, nurture, feed, and groom your equine friends to help them grow from foal to adult! - BREED over a HUNDRED unique HORSES and PONIES from the most famous ones: Gypsy Vanner, Black Forest, Arabian, Thoroughbred, Clydesdale, Shetland Pony, Quarter, Mustang and more. 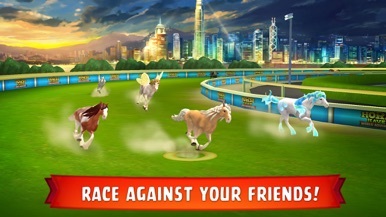 - Mate your champions with your FRIEND's to unlock the rarest and best horses! 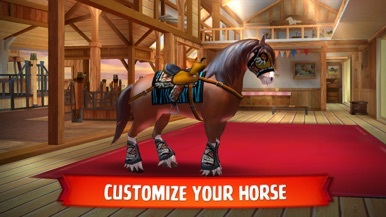 - CUSTOMIZE your horses with stylish saddles and fancy leg wraps. - CAPTURE and SHARE their best looks with your friends. - RUN STEEPLECHASE AROUND THE WORLD and compete in the most gorgeous backdrops: The hills of Rio de Janeiro, Lapland’s Northern Lights, Japan’s cheery blossoms, and more. - CHALLENGE YOUR FRIENDS to win trophies and climb the daily leaderboards! · Several Subscription options (2) : Monthly plan available from level 9 on and Yearly plan available from level 20 on. · Speed up all your favorite activities : harvesting resources and training your horses are 30% faster within the duration of the subscription. · Enjoy your always-on Magnet for Steeplechase and the unique Coins Collection button for the duration of the subscription. · Get even more with the Yearly plan : 50% faster Purebreeders’ Society’s quests and a unique gift each month. · Payment will be charged to your iTunes account at confirmation of purchase. · Subscription automatically renews unless auto-renewal is turned off at least 24-hours before the end of the current period. · Account will be charged for renewal within 24-hours prior to the end of the current period, and your statement will be billed as ""cost of renewal""
· Subscriptions may be managed by the user, and auto-renewal may be turned off, by going to the user's Account Settings after purchase. · No cancellation of the current subscription is allowed during the active subscription period. Our game requests wifi, mobile data, Calendar and Photo access to ensure basic functions. Breathing 是一个基于番茄钟的应用，它带给用户一个呼吸式的工作、学习方式。 Breathing is a pomodoro based app ,it brings an idea of studying/working style with breathe to users. Our Lady Star of the Sea.